We have discussed in detail why keeping our blood sugar balanced is so important, see here, but what we have not yet discussed is HOW to keep it balanced. 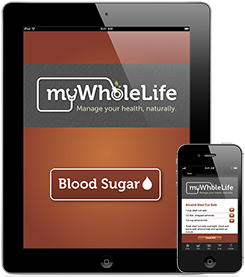 Thankfully, the team at WholeLife Holistic has designed an amazing app that will give you endless tips, recipes, and supplements to support you—making balancing your blood sugar a breeze. As a teaser, let’s have a taste of a few key pointers to keep you balanced. Although it may serve as a delicious addition to your breakfast on occasion, grabbing a coffee on the go does not mean you have consumed breakfast for the day. If you can do one thing for your blood sugar, eat a balanced breakfast. An example of this may be a bowl of oats with berries and cinnamon, or even a cup of yogurt with some hemp seeds and berries. Make the time for breakfast, and your productivity through the day will skyrocket! 2) Do like grandma, always have a snack in your purse! Having something on hand to eat through the day in a pinch is a great way to avoid plunging blood sugar. Raw nuts are great, and granola, an apple, or even some rice crackers could do the trick. Try to eat something every two to three hours. Cinnamon, true cinnamon, has an amazing ability to help stabilize our blood sugar. If you are grabbing a coffee, having some sweets, or even almond butter on an apple, sprinkle some cinnamon to reduce the risk of low blood sugar-induced shakes. Exercise does the body good! Fitting some form of exercise into your routine will help to control your blood sugar levels. Try going for a walk after dinner rather than crashing on the couch for the night. This is just a tiny taste of the ways we can stabilize our blood sugar levels. More details and tips are just a click away. Get the Blood Sugar App here today!